This legendary king and queen are portrayed in incredible detail, from the chainmail showing through the cut-outs on his sleeves, to the pattern of the cloth in her dress. Seen from the back, his cape has a dragon pattern, and a beautiful purse hangs from her belt. They form a heart in the space between them when joined, and separate for drinking. Austrian crystals sparkle in their crowns, in the center of the rose she holds, and on the hilt of his sword. 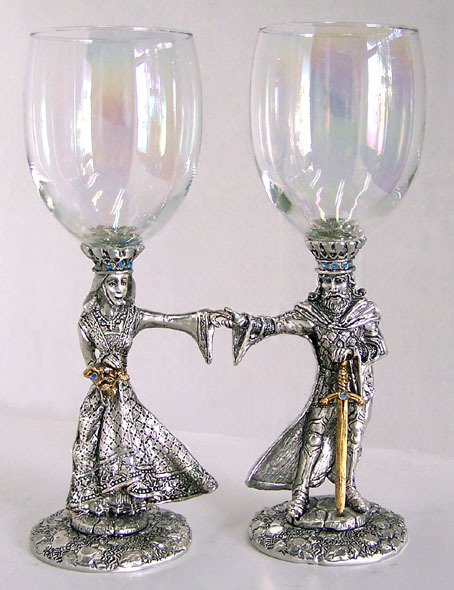 We make them by hand from lead-free pewter and fine glass with 23k gold plating on her rose and his sword. Each glass holds 12 ounces when filled to the brim. * For our life-long GLASS REPAIR GUARANTEE go to "Cleaning & Glass Repair" near the top of our home-page. ** To see GLASS COLORS click on the "Color Chart" at the bottom of this page.